Welcome to a new chapter (get it?) of your life. Are your resolutions honed and polished, just waiting to be broken? Or, do you live on the edge and not bother with resolutions at all? Either way, I’m not here to judge. I am, however, going to suggest some practical tips for reading more in 2019 - because that barely counts as a resolution. In my younger years, I had an attention span not yet destroyed by the advent of the mobile phone and could devour hundreds of pages in a sitting (albeit a very long sitting; I wasn’t the outdoorsy type). These days, I complain like everyone else that there’s just no time to read, as I scroll through Facebook while binge-watching Netflix. So my first practical tip? You guessed it: Pick up a book whenever you could pick up your phone. Stash a book in your bag, and sneak a peek when you can—in line at the store, while having your car’s oil changed, etc. If you don’t want to carry a book, download an eBook from Central Rappahannock Regional Library. Plus, when an eBook is due, it magically disappears with no fines. Second tip: Bribe yourself. How? By signing up for CRRL’s winter reading program for adults. 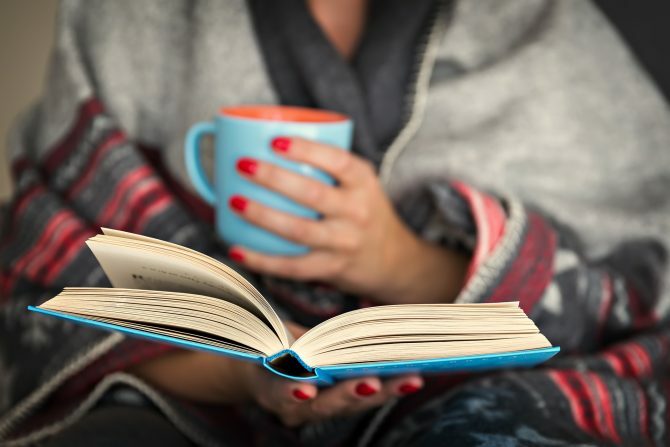 All you have to do is read four books in three months (you got this! ), and we give you a curvaceous cappuccino mug in a classy cobalt blue. If you’re feeling extra ambitious (it is only January, after all), you can also complete missions for the chance to win movie tickets and free books. Get the full scoop at librarypoint.org/winter. Third tip: Put the book down. You know, that beloved classic that 99 percent of the population has read and adored, but you secretly can’t stand? I hereby release you from any self-imposed obligation you have to finish every book you start. Life’s too short, and there are too many books you actually want to read. A good rule of thumb is to read to your age: If you’re 50, read the first 50 pages. If the book doesn’t grab you by then, release it into the wild, and move on. Final tip (for now): Join a book group. You know you’ll read at least 12 books in a year, and the accountability of having to read for a group can really light a fire under your ... Anyway, CRRL has book groups at most library branches - and even some at local breweries and coffee shops. If you want something low pressure, try our new Book Chat groups, where you can read what you want and indulge in some literary chit-chat. Arthur Ashe was born in Richmond in 1943, and was a tennis player who became the first African–American to play for the U.S. Davis Cup in 1963 and won both the Australian Open and Wimbledon. More than that, Ashe was a human rights activist, advocating for sportsmanship, education, and racial equality before his death at age 49. In Freefall by Jessica BarryMaggie Carpenter learns that her estranged daughter, Allison, has died in a private plane crash along with her fiancé. Though deemed an accident, Maggie can’t let go of the idea her daughter might still be alive. As it turns out, she’s correct: Allison survived the crash and is fighting her way to freedom, but someone is tailing her through the mountains, and that someone wants her dead. The Year of Less by Cait Flanders is a personal memoir is relatable to anyone who partakes in the therapy of the retail variety. In her 20s, after racking up $30,000 of debt on consumer products, lifestyle blogger Cait Flanders worked to pay off all of her consumer debt and realized her spending habit wasn’t actually making her happy. So, for one year, Cait attempted to manage her shopping habit, purchasing only necessary items. The rich cultural backdrop of modern-day Pakistan breathes new life into Jane Austen’s Pride and Prejudice in Soniah Kamal's Unmarriageable. An Austen fan herself, Kamal remains faithful to the original story while dazzling readers with a humorous and entertaining update of a beloved classic (meaning this is one you’ll actually love). On a 700-mile drive north to Minnesota, two college students are suddenly fighting for life in the icy Black Root River, just miles from home in The Current. One girl’s survival and the other’s murder shocks their small Minnesota town, thawing memories of another young woman who died in the river 10 years before - and whose killer may yet live among them. Tracy McPeck is Adult Services Coordinator at Central Rappahannock Regional Library. This column originally appeared in The Free Lance-Star newspaper and is published here with their permission.